This is a new German band playing mostly instrumental music. The first track is a slow spacey blues one that leads into the fast and short stoner rock like track, White Crystal party. Ride with the Devil, starts with a Clint Eastwood movie sample before the really cool guitar riff and groove kicks in with some psyched out soloing. Dynamic stuff with a lot of changes in these short tracks. 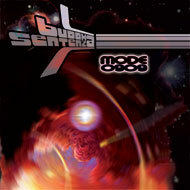 Saturn starts with a spacey beginning and some more sampled sounds and slowly builds up and some nice soloing again. Noise from the Death Factory is another short and quite fast track with some added piano that really works well. Kehakeeltekool is over 8 minutes and starts quite spacey before the guitar riff flows in and the loud kick drum hits you in the forehead! The organ is a very nice addition in the track that reminds me of Birth Control somehow. Great ending to this track. Sexual Omega features a quite cool flanged out sound. The CD ends with Ate Itself, which is very spaced out and a strange piece. The CD comes in a very cool foldout package with some stickers. Very personal and a good debut.